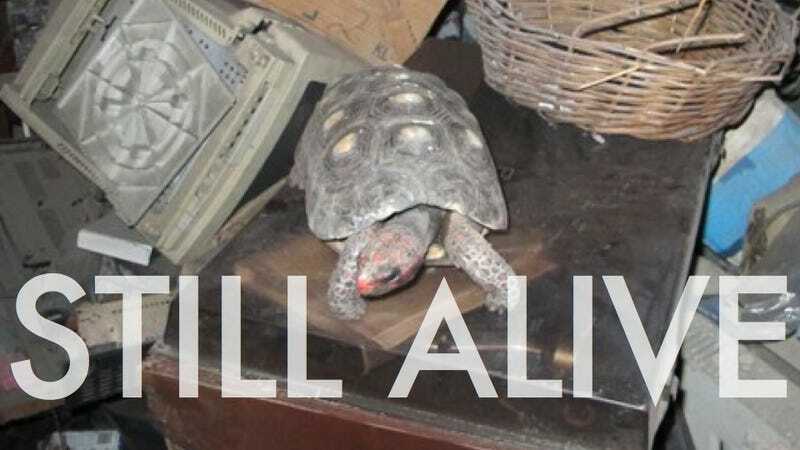 Manuela the red-footed tortoise was believed to have made her grand escape back in 1982. Her owners, the Almeida family of Rio de Janeiro, had been preoccupied with a home renovation at the time; Manuela, they surmised, had slipped unnoticed through a door left open by some careless workers. They thought Manueala had escaped. They thought they would never see her again. When Leandro Almeida was taking out the trash, he really had no reason to believe he was throwing out a family pet that had been missing for 30 years. But that's what he almost did. Almeida's neighbour in Rio de Janeiro spotted the bag and asked Almeida if he was throwing out the turtle as well... it seems Manuela was hanging out for 30 years in the upstairs storeroom where Leonel Almeida, the father, kept all sorts of old junk he hadn't gotten around to fixing up. When Leonel died earlier this month, Leandro and his siblings decided to clean out the storeroom, and that's how Manuela came to be by the curb. According to veterinary scientist Jeferson Pires, tortoises like Manuela are remarkably resilient creatures, and can survive two to three years without eating anything. While they typically subsist on an omnivore's diet in the wild, the Almeidas think Manuela got by on termites. Hats off to you, Manuela. You are a champion. And possibly immortal or something.